Preheat oven to 400 degrees F. Line a baking sheet with foil, and spray with cooking spray. Halve the squash lengthwise and use a spoon to scrape out the seeds. Slice into half moons without peeling (the skin is edible). Transfer to the baking sheet and toss with olive oil, salt, pepper and spread out on a single layer. Roast, tossing occasionally, until just tender and golden brown, check after 20 minutes. Heat grill or a cast iron pan over medium-high heat. 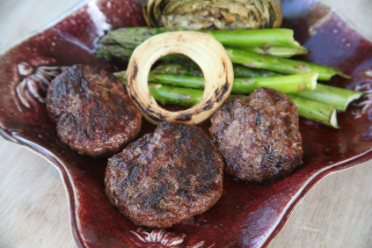 Form the meat into 2 to 3-ounce patties, packed tightly. Season with salt and pepper. Place the sliders on the grill or pan. Wait until they are nice and crusty on the first side, about 4 to 5 minutes and then flip and cook another 4 minutes. When the sliders are about done, top with desired cheese and close the grill, allowing the cheese to melt. Place the slider on mini burger buns and top with the caramelized leeks. Trim away the root end, tough outer leaves, and dark green tops of the leeks. Cut the leeks lengthwise into quarters, then crosswise into thirds. Wash the leeks well to remove any grit, and drain in a colander. Melt the butter in a large skillet over medium-high heat, and cook and stir the leeks until they have started to soften, about 5 minutes. Sprinkle the leeks with brown sugar, and cook until they turn brown, 15 to 20 minutes. Sautee your greens in some olive oil for about 2 minutes, add chopped garlic, and saute for another 30 seconds or so. Easy and perfect.